I start by stating what I think I believe. I test those preliminary statements of belief against what people in the Gospel of John believed and why. Some did not believe, even though they were eye witnesses to the events that became the Christian revolution. I examined my preliminary beliefs against the statements of belief of some of the most famous and celebrated scholars, philosophers, theologians and creative thinkers in man's history. I also considered the beliefs of famous contemporary and ordinary Americans. I examined my preliminary beliefs against my experiences and against my current battle with cancer. I conclude with a refl ection about The River and how The River runs through my life and yours too. 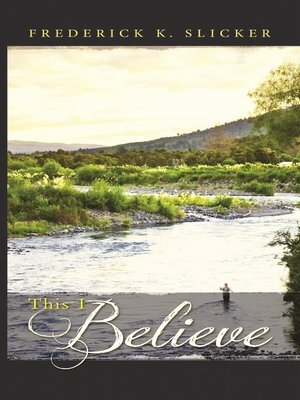 This I Believe is a personal journey, which every man and woman will take at some time. This I Believe could be a road map for you. God desires deeply for me to seek Him with my whole heart and to surrender to His grace. In seeking God, my journey has taken many twists and turns, but incomprehensible peace, joy and grace beyond measure await me and you, as we surrender to the God in control. We can trust Him, completely!